Over the past two decades, legal thought and practice in Latin America have changed dramatically: new constitutions or constitutional reforms have consolidated democratic rule, fundamental innovations have been introduced in state institutions, social movements have turned to law to advance their causes, and processes of globalization have had profound effects on legal norms and practices. Law and Society in Latin America: A New Map offers the first systematic assessment by leading Latin American socio-legal scholars of the momentous transformations in the region. Through an interdisciplinary and comparative lens, contributors analyze the central advances and dilemmas of contemporary Latin American law. Among them are pioneering jurisprudence and legal mobilization for the fulfillment of socioeconomic rights in a highly unequal region, the rise of multicultural constitutionalism and legal struggles around identity politics, the globalization of legal education and practice, tensions between developmental policies and environmental justice, and the emergence of a regional human rights system. These and other processes have not only radically altered the institutional landscape of the region, but also produced academic and practical innovations that are of global interest and defy conventional accounts of Latin American law inherited from law-and-development studies. Painting a portrait of the new Latin American legal thought for an international audience, Law and Society in Latin America: A New Map will be of particular interest to students of comparative law, legal mobilization, and Latin American politics. César Rodríguez-Garavito is Associate Professor of Law and founding Director of the Program on Global Justice and Human Rights at the University of the Andes. Why not download our FreeBook Law and Society: A Routledge Sampler? 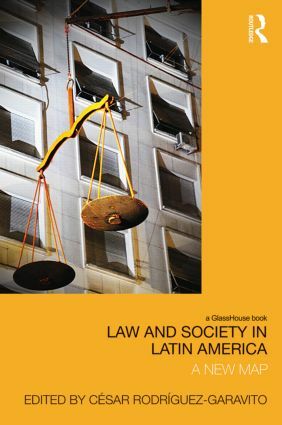 This resource contains a chapter from Law and Society in Latin America, along with a selection of excerpts from our other titles in the field of sociolegal studies.